Selenium is an essential trace element which activates one of the most important antioxidant enzymes in the body protecting tissue cells from oxidative damage caused by free radicals. It is also essential for healthy immune functioning. Selenium Plus from HealthAid is a specially formulated supplement, fortified with vitamins A, C, E and Zinc, to provide a powerful antioxidant combination with great free radical scavenger properties. 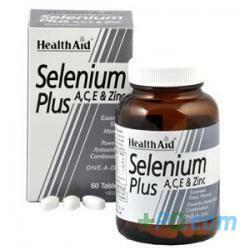 Delivery cost of "Healthaid Selenium Plus (vitamins A, C, E & Zinc) - 60 Tablets"